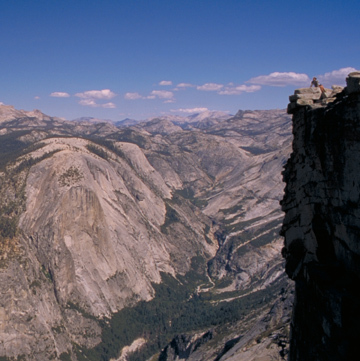 It's pretty much a foregone conclusion that if you like hiking, then Yosemite gets maximum marks. So it was then, that when talking to two of my old friends, it was again the place to go. 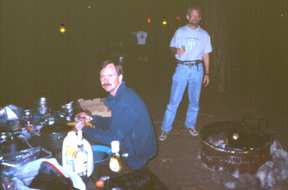 Two of us have enjoyed camping and hiking there before, and it would be the first time for Mark. He was pretty keen for the trip, and was willing to do an overnighter as well. So we set off on the usual airplane hops. The most direct flight was through O'Hare in Chicago. 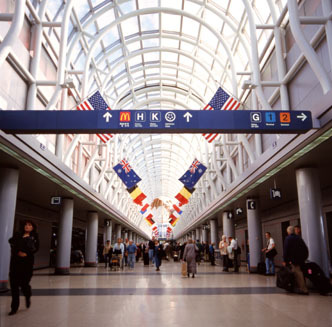 While the terminals seem to run on forever, they are very airy and bright, not like the dark and derelict older airports that make you think you'll be travelling by underground mine cart rather than through the air where the sun is always shining. San Francisco airport has had major improvements the last few years, and it shows beautifully. Unfortunately, the rental car management is totally regressive. Before the recent consolidation of rental agencies service desks in one offsite building, you would catch a company's dedicated bus which would take you to their area fairly quick and clean, but with a lot of buses cruising the terminals for customers. In my opinion, the person who planned the logistics for the new rental car customer service area should be dismissed. And so should their manager, who should have seen a disaster looming even as it was in the concept stage. Picture this: generic buses converge at the new service desk area and discharge customers. Customers then walk along a long outside awning covered sidewalk to reach the counter area. You enter the service desk area to find a long line of all the agency's counters along the wall facing you (150 feet or so along the far wall), and in front of this long row, you have a wholly inadequate waiting area for lineups. There is perhaps 40 feet of depth all along in front of the counters, in which customers must queue. When we arrived, there were long serpentine lines filling the whole room, and the lines did not wind just in front of the appropriate agency. The place was so full, some people could not even get in the doorways from outside. People and carts clogged everything, with no through-paths. Indeed, one gentleman was furious to the point of being speechless when he discovered that in spite of waiting patiently for ages , he was in the wrong line. You had to essentially trace the lines of people back from the desk to find which one you needed to be in. What a mess. And on top of that, a washroom at the left end with loads of empty floor space and only two urinals for busloads of people fresh off airplanes hoping for pit stops before getting their cars. Did anyone consult a process engineer, or logistics person before investing this plan in bricks and mortar? And how much consultation must there have been. Sad as it is to say, it's scary to think that this was the result of an actual plan. Probably it was done by a committee with seven hind legs, using fax machines and dinner napkins. But before you're tempted to fly into SJC (San Jose) instead, check out the difference in daily rental car rates. 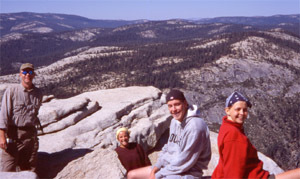 We're booking another trip right now (March 2001) and the SJC rates can be 50% higher than from SFO. On to the plus side, it was sunny, as usual. And the escape over the hills toward Yosemite the next day was heralded by warm 80 plus temperatures and buckets of sunshine. 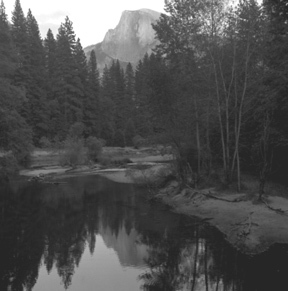 El Capitan at left, Bridalveil Fall at right, and Half Dome straight ahead! 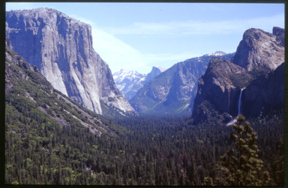 Our plan was to get settled in to our campsite, spend a day in the valley and then do an overnight trip into Little Yosemite Valley, and up Half Dome. 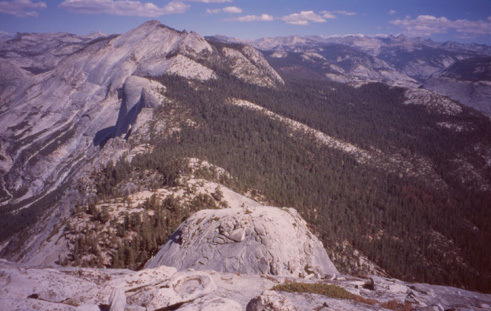 My knees have trouble down-hiking, so the Half Dome main event (and most important) was to be the first hike, in case there was no second outing. 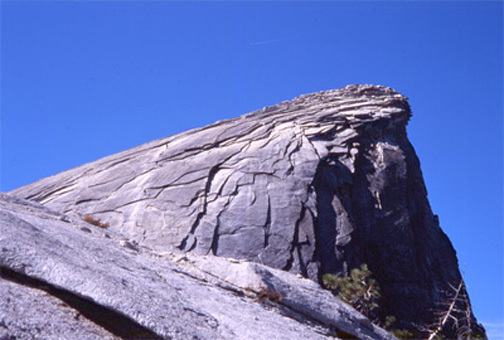 On this visit, the road to Glacier Point was open, so we went up and managed to get the first side view of Half Dome. It's a lot narrower than it looks from the valley, even though it is still almost one mile from top to the valley floor. 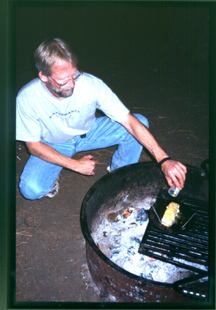 <<Picture note>> For some shots, I've included a stereoscopic pair side by side. If you'd like to see a bit of depth in the scene, use the "crossed-eyes" method from about 8" to 18" from the screen. The actual distance depends on what works for you as feeling the most comfortable with the best rendition.. Make sure your eyes are level with the pictures and keep your head still, in the middle. Looking down from Glacier Point into the valley below. Can you see the Highway and the bridge? 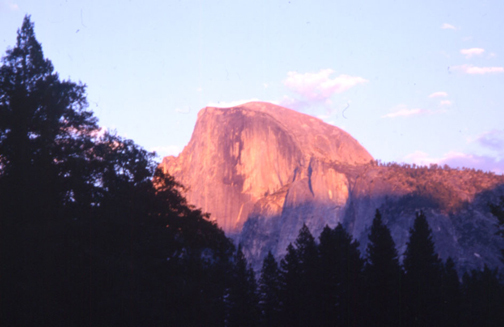 On the right, we can now see Half Dome edge-on. It's really surprising just how narrow it is, after seeing it "face-on" from the valley floor. A good climb and two hours later, the next benchmark is reached; here at Nevada Fall, a boulder watches over the vast depth of Yosemite valley below. 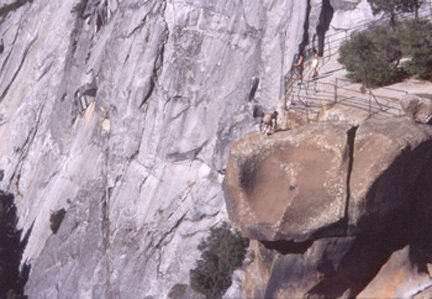 This photo pair is looking over the edge of the Nevada Fall "escarpment", and Yosemite Valley is straight ahead. Off to the side, it's interesting to see people using their cell phones while sitting on the slick rock overlooking the valley. The common theme is calling people to share the experience in real time, even if they are in France! Trail maintenance never ends. 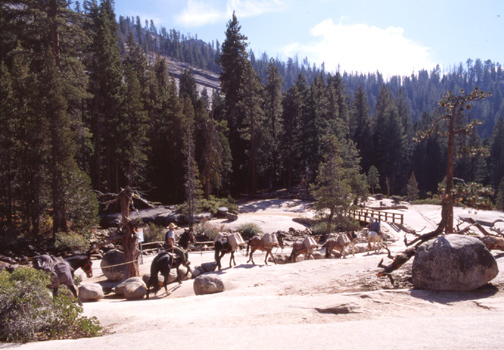 The Park Service uses mules in pack trains to move the materials and supplies. Here they are about to cross the footbridge over the river, about 50 feet from the fall's edge to the right of the picture. A closer look of the flat rock at river's edge, just upstream of the bridge. And right at the edge, this gentleman (he IS wearing shorts) tempts fate. He's actually moving carefully back up to safety, but striking a pose like that is just asking for it.! 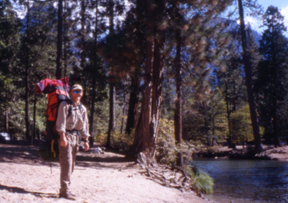 After a brief rest at Nevada Fall, we follow the Merced River along Little Yosemite Valley for about a mile to get to the backcountry campground, where we will set up tonight. 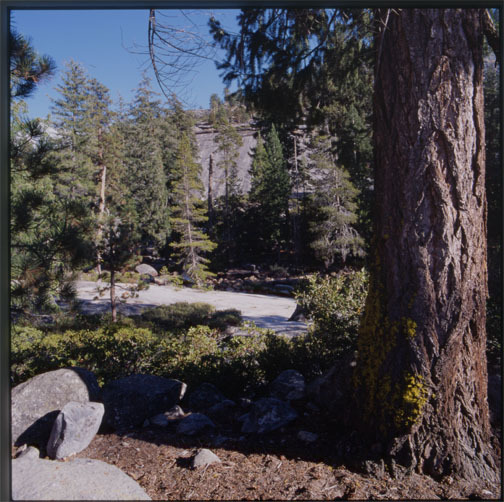 Even thought the water level in the river is low in October, you can easily use your filter pump for drinking water, as this is the last place to do so before veering away from the river on the way up to the base of Half Dome. Just be sure to use a filter cartridge that's good for crypto and Giardia. 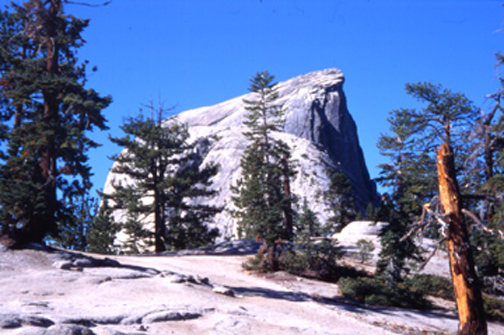 Because of Half Dome's height and topography, the trail up must wind its way around the "back" and then up onto the "shoulder" , seen as the left hand side "hump" when viewed from the main campgrounds and bridges in the Valley proper. 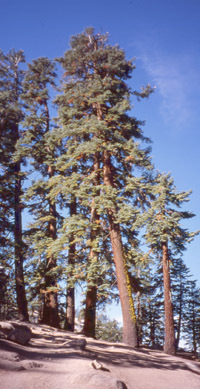 As we leave camp, the first "warm-up" stretch so is pretty flat, only rising about 50 feet to 6150' in a quarter mile. The next 2.2 miles of trail is pretty much a steady 8 degree angle up to an altitude of 7726 feet. Steady gentle climbing leads us through pretty heavy forest as we make our way. We then have a half mile segment of gentler slopes and a bit of up and down that takes us to 7930 feet, and the start of hard work. 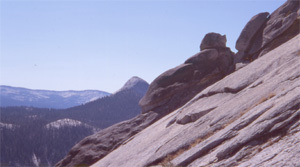 To your left as you climb are various large boulders perched on the curving surface. And you know you're making good progress when the "Duck" comes into view on the left. And then you come right up onto the "shoulder" . Here people suntan and rest, either getting ready for the last stretch, or to spend the day watching the show. 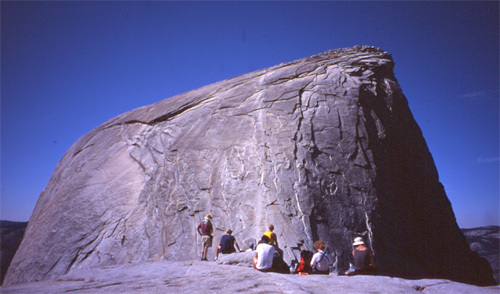 Climbers rest and watch those ascending. Can you see the people hiking up the last slope? The last leg of the ascent is with the use of the "cables". But you want to wear leather gloves for these steel cables- and there's a large supply of them you can borrow from the pile for the round trip. 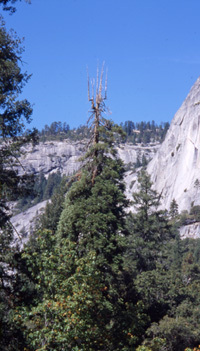 In the valley, at the bottom of the hiking trail to Half Dome, there is a seasonal sign that announces whether or not the "Cables are Up". They're taken off the poles over the winter, and so if this is the case, you can't go any further up than the shoulder. Forming a handhold on each side up the steep smooth rock, these cables keep you from straying off into oblivion, and let you "pull" yourself up in sections where most people's boots let go. On the steepest sections of cables, there are wooden planks as footholds between the cable support posts. If there's a wagon train of people going up, you can rest a little standing on these. You cover about a quarter-mile of angled distance, and rise 40 stories in the process. So there I was, halfway up along the cables, taking a short rest. A good carabiner and rope loop lets you clip onto a cable to let others pass by with no worries.... So I'm looking back down along the lines at the people following far below. And then there's this flurry of sparkles in the sun just visible as a small cloud blowing way down on the cables. It takes a few seconds to make some sense of what you see. And then it hits you- there's this little bouncing thing going down the ever-increasing side-slope and its stirring up these little fluttery bits. 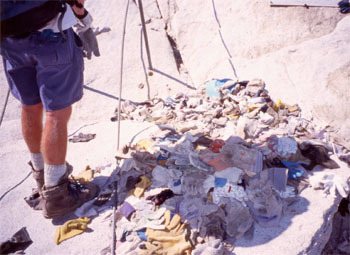 It's an "offering" to the Mountain Gods, in the form of some poor hiker's wallet. The money scattering in the breeze, and the credit cards flickering and reflecting the sun as they dance down into oblivion. And all you can do is watch. A few moments later, you see a jury-rigged rope (looking like a few pant belts tied together) used as a lifeline for the guy going out onto the slickrock to retrieve a few of the closer spoils. But the essence of it all is clearly history, although for the rest of his life he now has "bragging" rites and a great story for his armchair-athlete friends. And looking around, you can see enough room for many football fields on top. Man, it's huge....For a bit of "perspective", compare this view to the Glacier point view! Lots of happy people enjoying the view while having lunch. So after this, the return trip to valley bottom is welcome yet uneventful. And the weather stayed beautiful all the way. And back in the valley, we get another perspective. And a cold beer to go with it.